This post is sponsored by our friends at Vital Proteins. 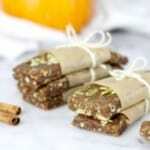 Our no-bake Pumpkin Spice Protein Bars are packed with fall flavor — and just 8 real food ingredients! I won’t lie. Bars in crinkly wrappers are pretty much a mainstay in my crazy busy mom-blogger life these days. It seems I’m always grabbing one from the pantry to tuck into a lunchbox, a backpack, my gym bag or into the cooler for a road trip. They’re just so darn convenient. And more often than not they’re saved me (and the kids!) from pitching a hangry fit in parking lot or along a trail. But even with all the great choices out there, the dietitian and mad kitchen-scientist in me felt compelled to 1.) 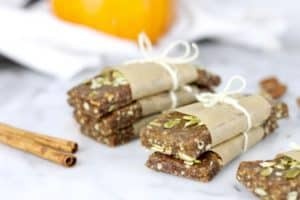 improve on one of my family’s favorite bars (and to indulge my love of all things pumpkin right now) and 2) make a bar that was technically Whole30-friendly as long as it’s enjoyed occasionally and not used as a crutch to prop up an after-dinner or mid-afternoon sugar craving. My kids love Larabars. Probably because they’re so sweet and soft and come in tons of flavors. I think they’re pretty good too except for one thing: They’re lacking in the protein department. They’re really just carbs and fat – and simple carbs at that, thanks to all that dried fruit. And If I’m going to grab a bar, it had better be balanced and that means carbs, fat and protein! Currently there are only 2 bars out there that aren’t meat-based that are technically Whole30-compliant – Larabars and RxBars. Well, I already mentioned that the former is too low in protein and the latter happens to made with egg whites (there goes that egg allergy ruining all the fun again) – so neither are a good fit when I need something after CrossFit or when I get stuck running errands or when I’m out on a hike with friends. Until now, that is! 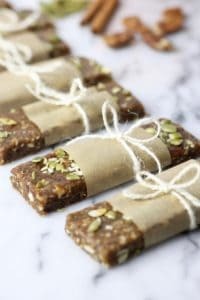 If you search Pinterest for ‘homemade Larabars’ you’ll get a million different recipes that involve a bunch of dates, nuts and other dried fruits. Which is great – the ingredients are super clean, they’re easy to make and you can make them pretty much any flavor your heart desires. But all that sugar from dried fruit starts to add up -even ‘natural’ sugars can spike blood glucose levels setting up up for crash + cravings. There I go with that sugar thing again. So to lower the sugar, I used fewer dates and made up for the moisture by adding pumpkin puree. A pretty simple hack that produced a bar that’s just sweet enough to be satisfying without being dessert-like. 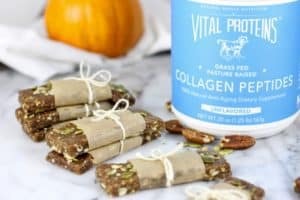 And to add protein, I added a generous scoop of my favorite Vital Proteins Collagen Peptides because, unlike protein powders, it won’t change the texture or flavor of the bars. Adding protein makes these bars more satisfying as a snack and more appropriate for use as a way to support recovery after exercise. Yes! If you’re new to collagen peptides check out this post about the health benefits of collagen. I literally use it everyday in some way – in my coffee, a smoothie, soup, etc. to support my bones and joints and I’ve even noticed much thicker and stronger hair and nails since I’ve been using it. You can whip up your own batch of Pumpkin Spice Protein Bars in just 15 minutes – with only one bowl and no baking! 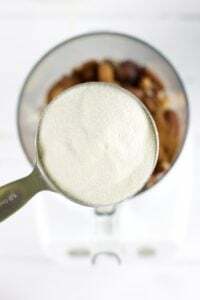 The fruit and nut mixture should come together in a ball when you pinch some between your fingers. If not, add a few drops of water and process again – repeating this step until everything holds together well without being sticky. Pumpkin and protein never looked (or tasted) so good! You don’t have to wrap them with pretty little bows though the parchment paper does keep them from sticking together during storage or in a lunch container. But if you do make them pretty why not share with a friend who could use a little pumpkin spice love today? 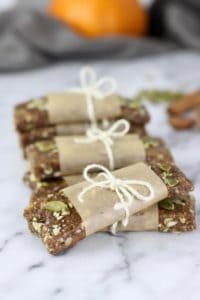 These no-bake fruit and nut bars feature the best flavors of fall and get an added protein punch from collagen. They’re great for post-workouts, lunch boxes and busy people on-the-go who need a balanced snack. 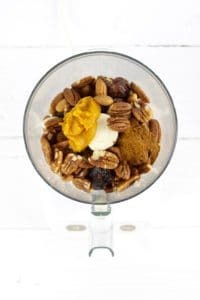 Place all ingredient (except pumpkin seeds) in the bowl of a food processor. Process until mixture is crumbly yet still holds together well when pinched between your fingers. Press mixture into the bottom of an 8×8-inch pan (or onto a parchment paper-lined baking) sheet. Sprinkle with chopped pumpkin seeds, pressing them lightly into the surface. Cut into 8 bars. Wrap in parchment paper and store in a covered container in the fridge for up to 1 week. What’s your favorite protein bar and when are you most likely to eat it? Give us the scoop in the comments below! This post was made possible by our friends at Vital Proteins. Though we received compensation for this post, the opinions expressed here are 100% our own. Thank you for supporting the great companies we works with thereby allowing us to continue creating great recipes and content for you. Yum!! I love all things pumpkin! And these look fabulous! Thanks, Erika!! I love everything pumpkin, too- and these have become my new go-to bar option. Can you sub Great Lakes unflavored gelatin for the vita proteins? I haven’t tried it with the gelatin but my guess would be yes. 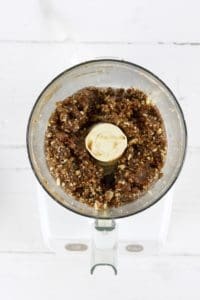 You may have to add just a tiny bit of water to the fruit/nut mixture depending on how moist your dates are and whether or not you have trouble incorporating all of the gelatin into the mixture. Start with just a few drops of water and increase from there. We’d love to here how the gelatin works for you if you make these! Thanks for the quick reply, I’m going to make them now, I’ll update you later! Well, I made these last night and refrigerated them overnight. Added 2 t water while food processor was running, then added 2T more pumpkin. They taste good but are crumbly and don’t look like your picture. I also used roasted almonds, maybe that affects it too? I’m sorry to hear that your bars turned out crumbly. What kind of dates did you use? I use the large medjool dates that I have to pit myself – not the diced (and very dry) kind you might find in the baking aisle of the supermarket. If your dates were very small, that may explain the crumbliness. It should actually be a bit on the sticky side even before adding the gelatin and water. I don’t think the roasted almonds would have had much effect on this recipe since I’ve also make it with roasted sunflower seeds too. Perhaps you just need a little more tweaking and possibly, a few more dates. I used the other dates, dar-something. They were on the small side. I’ll try again in a few weeks, thanks for all your help! Of course! Better luck next time with the bigger dates – you’re going to love these! Do you need to use the Collagen Peptides? No, you don’t need to add the collagen peptides. They are just used to add extra protein and leaving them out won’t affect the taste – though your bars may be a tad bit stickier depending on how large your dates are. It is definitely the time of year for pumpkin! I can’t wait to give these a try. Thank you for the post. 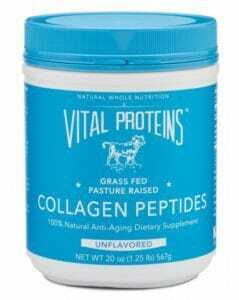 Is there any substitute for the Collagen Peptides? I couldn’t get my hands on them. You can leave the collagen peptides out. They’ll just be lower in protein. Also, depending on how big or how moist your dates are, you may need to use 1-2 fewer since the collagen does soak up some of the moisture. Hope that helps- happy pumpkin season! Another variation of power bars. I love the idea of pumpkin. Yes, they are! I wrap them individually either with parchment or plastic wrap before freezing so they don’t stick together. I tried this with ground almonds as I didn’t have any whole but it was so wet, have put in the fridge hopefully will firm up! If you have any extra ground almonds you could add more to the mix to see if that helps the mixture firm up a bit. Could I use cricket powder instead of the vita proteins? And do you know where I could get something like vita proteins for a good price in Canada? I want to try this recipe so badly!! You could use cricket powder if you’d like. As far as where to get vital proteins collagen in Canada…really any unflavored collagen protein would work in this recipe. So whatever is available to you and at the best price will work.